New Style Seats in a 1971 Mustang? I have a 1971 Spring Special coupe Mustang. It has been painted and the drivetrain has been rebuilt. I am 6'7" and hate the straight back, non-reclining seats. I have seen the black leather seats in the new 2005+ Mustangs and think they would look GREAT in my car. How hard/how many problems do you think I would have with the tracks, etc? Thanks! Width wise, I don't think you should have too many problems. 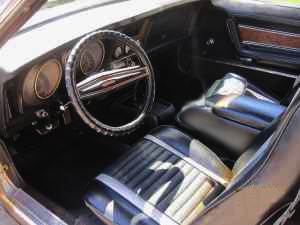 The issue that you are going to have using new style seats in a 1971 Mustang, is going to be the same in any 1971-73 or 1965 to 1970 Mustang, and that's the seat platform. You may have to fabricate your own mounting platform or reinforcements to make the newer seats fit, as the old style seats have specific bolt locations which align with the holes in both the platform and the floor pan. The good news, however, for someone over six feet tall, is that if you remove and replace the oem Mustang platforms with fabricated pieces, you may also be able to pick up another inch of headroom. Note though, that the inboard side of the perch is actually not as tall as the outer side, due to the fact that the floorpan on 1965 - 1973 Mustangs curves upward into the transmission tunnel from about the middle of the floor pan. So don't make both brackets the same height! Other than that, installing new style seats in a 1971 Mustang could be a nice addition.